Cate: Please welcome Elizabeth J. Kolodziej. Elizabeth, will you please share a short bio with us? Kolodziej: Hi! Let's see, I was born and raised in Torrance, California. My parents were always keen on my brother and me reading, which we grew to love more and more. In my early teens I was moved to Delaware. It was while in Delaware that I started my first book that I would never finish. When I was around 19 I began Vampyre Kisses. The first novel I would actually get to finished. After going to George Mason University and getting a BA in English (concentration Fiction Writing) I would eventually fly to Ireland and finish the book. A year or so later I would self-publish Vampyre Kisses and that is how we have come here today. Cate: Tell us about Vampyre Kisses, and where it's available. Kolodziej: Vampyre Kisses is about a young woman named Faith who doesn’t realize she is a witch until after meeting the 400-year-old Irish vampire, Trent. Trent is a vampire who loves being a vampire but wants a little love out of life; while Faith is yearning for a little excitement. They bring these things to each other. In the process important gems are stolen from the werewolf royalty and vampire master. This leads to an adventure in finding out who stole the gems, why, and how they can get them back. In one quick motion, he grabbed her and swooped her up like a groom does a bride through the threshold. “Let’s see what you got, Trent!” he challenged, jumping onto the railing and balancing there with ease. He held Faith out over the city streets, and she began to scream, kicking her legs and desperately trying to hold onto Darren. “Eight stories can kill a person, you know,” he yelled over her screaming. Pushing her off, I watched her fall. I have lived long enough to realize, when something bad happens, time moves in slow motion. In one swift moment, before I could blink, I had jumped past Darren for Faith. Without thinking I jumped off the balcony and flew down after her, falling down and reaching out to her. She was falling feet first; I was falling face first. I reached out my hand for her. “Faith, grab my hand!” I cried. She looked up and I tried to reach. Our fingertips touched, but I could not get up the speed to grab her. I pushed myself as much as I could to make myself go faster as she neared the ground. I had to focus my mind on becoming closer. But it was difficult with the wind whipping at me. Finally, I was able to grab her hand. Pulling her up to me, I cradled her in my arms and held her close. We were falling fast. I shifted my position to land feet first. “What are you…?” Faith screamed, her hair blowing wildly in the wind. “Don’t worry. You will not be hurt,” I replied, glancing at her. The ground rushed up, and as my feet hit the concrete I bent my knees to a crouch. The impact was no more than if we had jumped off a step. I stood up slowly, still holding Faith in my arms. Looking down I gave an awkward smile, and got a weak smile in return. Well, this was going to be fun to explain. Kolodziej: Well, my mother was always interested in vampires while I was growing up. I guess I just kind of fell in love with the supernatural world along with my mother. When I was little I would fantasize about being a witch or meeting a vampire. I would read all kinds of books filled with witches, vampires, and werewolves. With all of this, I think it was natural to feel inspired by what I knew the best. Kolodziej: When I get an idea for a book I know the beginning and I know the end. The middle comes to me as I write. The characters end up coming to me and talking. Soon they get loud and I can’t ignore them so I have to write. The characters tell me who they are and what the plot is going to be. I am just their instrument to tell their story. Kolodziej: Yes, most definitely. I’m not so sure they haunt my dreams though. My dreams are kind of crazy to begin with. But the characters talk to me all the time and sometimes they can get pushy. When they get pushy I start to feel their emotions and see the story through them. It is truly a great honor. Kolodziej: The sequel to Vampyre Kisses. I am almost halfway done and the story is really turning out great. New characters will be introduced and this book will focus more on the werewolf history instead of the vampire side of things. It should be an exciting read. 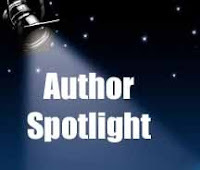 Kolodziej: I am a freelance writer for Demand Studios, you may see some of my ehow.com articles around some time. Hehe. Cate: Oh cool! Describe your writing in three words. Kolodziej: The most challenging thing for me is finding the time to write. When I actually get up the nerve and start writing it becomes so much fun and I love it. The most rewarding so far is actually finishing a novel and people wanting to read it. It is truly a new kind of experience. 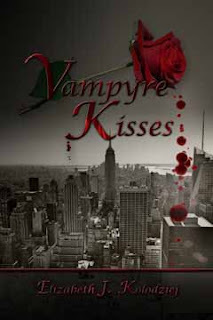 Kolodziej: Vampires.com wrote one of the first reviews for Vampyre Kisses. Moonlight had written, “I’ll admit it, when I saw the book the first thought that crept into my head was “great, another cliché unoriginal vampire love story.” But boy was I wrong, so very very wrong.” You can read this interview here. But I guess certain things never occur to me. Like people would end up thinking it was another Twilight; because, I know it's nothing like Twilight. Kolodziej: Tortall Series by Tamora Pierce, Hallows Series by Kim Harrison, Night Huntress Series by Jeaniene Frost, just to name a few. Right now I am planning on reading Personal Demons by Lisa Dez in a couple of weeks. Cate: Thanks so much for being my guest Elizabeth! Best of luck to you. Good Morning - interesting post. Enjoyed it. I'm a vampire lover as well. So mysterious.